Watch is daily need of every person because it embedded with some useful features like; it is a small portable timepiece that displays time, and sometimes the day, date, month and year. This Citizenwatch timepiece is especially worn on the wrist. Showing us the time for centuries, watches have evolved from the usual mechanical. This Mens Citizen Watch appearance is so attractive because it made up with combination of Stainless Steel Case and Leather Strap. The water resistance of this watch is also so good which is 100 meter. In this Citizen Automatic Watch Silver tone hands and markers are appeared beautiful and this also helps us to note time easily. Black and silver dial with skeleton window gives amazing look to this men’s watch. Its work on the automatic 21 Jewels Made in Japan and caliber is 4166. This Citizen Men’s Watch has its Sapphire Crystal Glass cover as a protection purposes. It is basically to protect the watch from being externally damage and there also Screw Case Back. 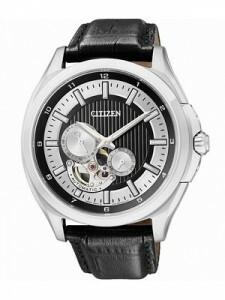 Citizen Mens is more user-friendly due to the position the user placed their watch. There is hinged, metal Push Button Deployment Buckle which can be opened so that I can easily put on the watch or take it off. The Case Size of this watch is 43mm with crown and Case Thickness is 12mm. This watch has been displaying time to mankind for years and the achievements this timepiece has obtained until now have inspired me. Without time, there won’t be day and without days, there won’t be any weeks. This watch is available for US $ 265.00 with us. Why pay more when digitals are just as accurate? Newsletter : Vintage Boom Again – Seiko “Turtle” Prospex Diver’s watches on Sale Discount Coupon inside!! !